Aside from being a fabulous event filled with AMAZING designers and artists, Make It Vancouver is also your best shot at getting first dibs on any Cagey Bee goodies you’ve had your eye on. As the holiday market season progresses (more shows listed on my Events page), I often run out of specific prints & lockets. No matter how hard I try, I never seem to predict exactly which ones will be the hot sellers. Caging the Forest Bird has been one of the long time favorites, but my new robot locket has been a close second so far. Will be interesting to see what happens this season! Vancouver’s largest indie craft, art & live music event! 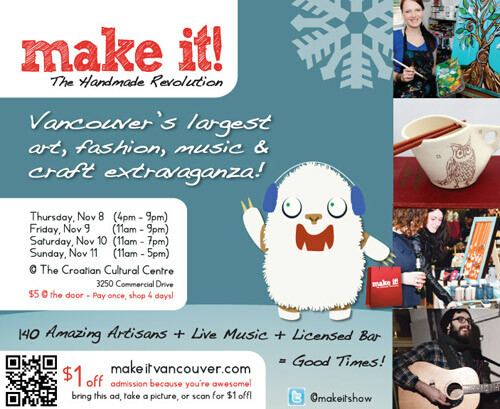 Reasons you will love Make It = over 140 Canadian indie crafters / designers, live music, delicious food carts, wobbly pops, nice friendly folks & an awesome vibe! Next postMake It Vancouver Starts on Thursday!